Aeromedical transport is no longer a concept limited only to military missions. Even though the term itself traditionally has referred to the heroic work performed by the United States Air Force, the meaning has expanded over the years to encompass the type of patient transportation services provided by Air Ambulance Worldwide. One thing Air Ambulance Worldwide has in common with the military is the dedication of our seasoned pilots, experienced and caring medical staff and our highly competent flight coordinators, who provide the most comfortable, efficient aeromedical experience possible to the patients who we serve. Every aeromedical service we provide is fully coordinated by our staff, leaving case managers and/or family members free to focus solely on the emotional and physical well-being of the patient. Every detail of the transfer is taken care of by us, and we will provide an all-inclusive quote up front, so there are no hidden fees. What you get for that fee is an aeromedical company with a perfect safety record, a dedicated flight coordinator handling your transport, medical personnel with at least five years of ICU/CCU experience and the peace of mind that comes with knowing that the potentially traumatic experience of long-distance travel under extremely difficult circumstances will be handled professionally, compassionately and efficiently. 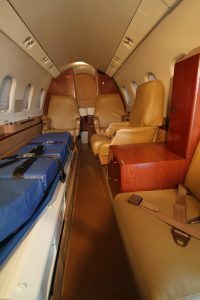 If you would like to learn more about our bed-to-bed aeromedical transportation services for patients anywhere in the world, call 727-781-1198 or e-mail Air Ambulance Worldwide today. We are proud to have earned the prestigious EURAMI accreditation, which is awarded to mobile air service providers with exceptional medical protocols and aviation safety records.